Unless you have been living under a rock I am sure you have seen that Krispy Kreme have given us not one but eight new doughnuts! EIGHT! Not all at once thank the lord, I am not sure my body could cope with eight in one go, albeit I’d give it a good go. Krispy Kreme have released four newbies and are staggering four vintage flavours. Todays’ review is all about the two newbies – Maple Crunch and Chocolate Smores. The third is Chocolate Firecracker however I draw the line at chilli in my doughnut, and the fourth is Salted Caramel Cheesecake and after the last Cheesecake ones not being cheesecakey, I skipped that also. Hand-dipped in maple icing and sprinkled with maple flavour crunch and a sparkle of gold dust. Oh Maple Crunch you had me at sparkly gold dust! 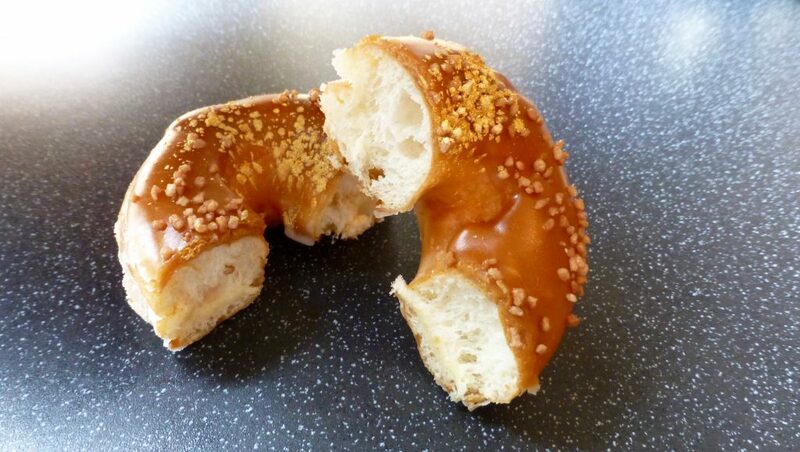 Krispy Kreme have decided to give us the Maple Crunch in ring form which I quite agree with. The smell was overpoweringly mapley, and being a maple syrup lover this sent my taste buds tingling. Cutting open the doughnut, look at that fluffiness! The doughnut was exceptionally light with a slightly doughy chew to it. The maple flavour was authentic, rich and came through with quite a punch which complemented the sweeter ringed dough. This maybe too much to handle for those who don’t like too much maple but I for one loved it, even if the crunchy pieces didn’t really give much crunch. What is better than actual Smores? Smores in doughnut form of course. Once again the dough was the iconic Krispy Kreme dough offering us a fluffy, light, doughy moreish treat. 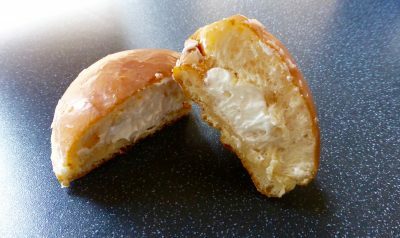 The mallow filling was a little sparse, there wasn’t enough to cover the outter edges of the doughnut. The mallow filling itself was silky and shiny but didn’t provide any form of flavour nor had that sticky texture you expect. The chocolate was the typical cheap synthetic chocolate which puts you on the back foot to begin with and the shortcake crumble, well that isn’t detectable and doesn’t contribute to the doughnut at all. As a whole this just doesn’t hit the mark. Voila the two new Krispy Kreme Doughnuts. It’s certainly a split bag. I absolutely loved the Maple Crunch, it was flavoursome, the dough was perfect, it was pretty as a picture to look at and it had glitter on…everything really is improved with glitter! The Chocolate Smores was a complete let down. Had I eaten it with no name to it I wouldn’t have guessed Smores and frankly the awful chocolate coating completely ruins it. Keep the Maple Crunch and ditch the Chocolate Smores. I’d love to know your thoughts on the new Krispy Kreme offerings. Keep your eyes on the blog for the new vintage Glazed Kreme review. If you are eager to know what the Chocolate Firecracker and Salted Caramel Cheesecake is like, hop over to my doughnut loving compadre Miss Snack Warrior.